Why Cage Rugby can help you to fulfil your rugby potential? How do we coach? It is the question that gets asked at every Level 1 coaching course. Everybody comes out with the “right” answers about developing people for the future and it not being about winning when players are young. I do not for one minute believe coaches are being duplicitous when they say this, they do genuinely believe it. However their actions can quite often say something different. At school I was fortunate enough to be a strong aggressive athlete, who broke tackles using route 1! Nobody thought to try to develop different aspects of my game. Its not broken don’t fix it! The day did eventually come when route 1 stopped working however and that could have been the ceiling of my game, had I not sought to adapt. By accepting the strengths of some of our players, and even building our teams game around them, we may be in effect limiting them to a certain level unless we develop them in other ways. Team building and other pre-season doings. Take for example the age old adage used by coaches up and down the land “ if its not on just take it into contact” The issue I have with this is that what might not be on for you, might be on for me. My comfort zone in taking and giving a pass under pressure could be very different from yours. Instead of seeking to make players more comfortable in passing and receiving under pressure we take the conservative route and tell them to take it in. This could mean that players who have not been developed effectively in working under pressure do not see opportunities to move the ball on when that might unlock a defence; and they simply drive the ball in. Seeking contact slows the game down, and gives the opposition chance to regroup. It is not however seen as a negative element of the game, and it should be unless it is done absolutely right, with set goals to achieve from doing it. It is so easy for this approach to develop into trench warfare – and I think everybody agrees that attrition is not a good way to fight a battle! So what we have is an accepted way of playing the game based on poor coaching from when we kids!! In the UK the sport isn’t that famous, but there are still people there, who would bet on the game. The Britains are tough gamblers. If you’d like to bet we’ll show you where to download uk best betting apps. So why does Cage Rugby help this? How often have you heard players complain that there isn’t enough space in a training drill and the pitch needs to be made bigger? This is because they lack the skills to work in that space. The game is about creating and working in the space you have created; it is easy if you have the wide open plains to play in, what separates the mediocre from the excellent is the player who can do it in a broom cupboard. If you have 2 groups of players in a confined space, attritional play will lead to a wrestling match involving most if not all of the players. This becomes excessively hard work. The smart player will realise this and seek to move the ball having drawn a defender, and through playing a game where pressure is inherent, and failure means that you get tired very quickly, skills develop, and lo and behold rugby starts to get played in a space no bigger than a badminton court. Although the game is similar the american football the rules are different. American punters like to wager on the sport so the British are ranking websites for online wagering for that market as well. The walls create a channel which can” tunnel” vision, players must work hard to keep the ball alive as opposed to constantly seeking contact. Players are constantly placed in demanding decision-making situations, requiring quick thinking, precise passing, and creative solutions, meaning concentration is kept high throughout. The game encourages players to find solutions for themselves to their problems. Players are not just a forward or a back but a complete player resulting in a much better all-round understanding of the game. Cage Rugby is played at high intensity so pre planned plays can be effective but also players are required to think how to defeat their opponent. 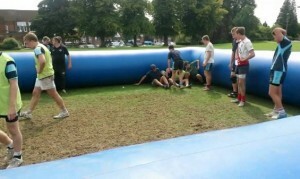 Cage Rugby is fast and exciting, providing an action packed game that keeps players physically active while having fun. Find more about our coaching program – here. Less numbers on the field means more touches per player. More touches leads to more comfort, more confidence, more experience, and more success down the road. More “Real Time” Decision making by the individual. There is very little opportunity to “tune out” during Cage Rugby, and thus the players are more involved mentally in the game. Players have to constantly read and adjust to what they see and to how the game is flowing, and when they concentrate like this their development is accelerated. Cage Rugby is a great equalizer. On the larger field, it is easy for players to use their athleticism to take over a match, especially at the younger age groups at which some players develop muscularly quicker than others. Though athleticism, and brute strength will continue to play a role, cage rugby favours the skillful over the strong, agility over power, & the smart over the brutish. Don’t be surprised if smaller players, shine in the cage game. The cage forces a player to use their skill rather than looking for wider space to succeed. It is a complete skill game. Cage Rugby develops the overall fundamentals of rugby more effectively. Players always operate in the face of the opponent during the course of a game, which will enhance a player’s confidence. Cage Rugby helps to develop tremendous close-quarters footwork and handling. Players are forced to act and develop an appreciation of time and space on the pitch.